Nerves, Arteries, And Muscles Of The Limbs - I.
I. Inner Deep Aspect of Thigh. II. 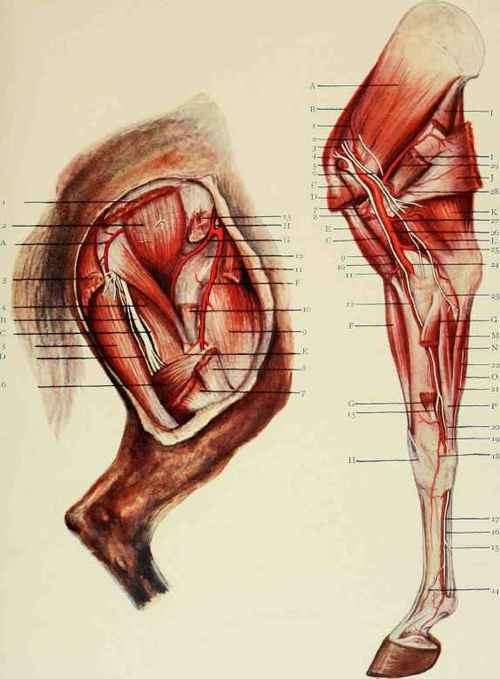 Inner Aspect of Fore Limb. 12. Tendon common to proas magnus and iliac us. G. Deep femoral artery. h. Prepubic artery. 4. Roots of median nerve. 15. Oblique branch connecting the internal with external plantar nerve. 22. Ulnar nerve. ■2'i. Ulnar nerve. 25. Ulnar artery. 2b'. Brachial artery. 28. Artery to latissimus dorsi. G. G. Flexor metacarpi interims. H. Extensor metacarpi obliquus. I,I. Teres major. M. Radial head of flexor metacarpi medills. N. Ulnar head of flexor metacarpi medius. P. Conjoined tendon of flexor metacarpi internus.